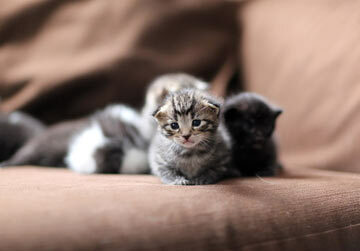 I saw a tweet in early February that Alanna Burke’s rescued city cat was expecting a litter of kittens any day. Burke’s Twitter account was updating everyone daily on ‘Momma Holly’s’ pending status-and also mentioning her new rescue initiative called Temple Cats. 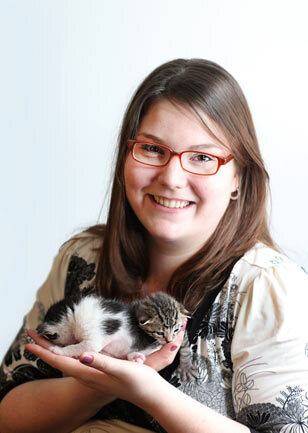 As an animal lover, Burke had caught my attention-it was a chance for me to see, hold and experience a newborn litter of kittens while learning about this young woman’s mission to control Temple University’s feral cat population. Burke was well aware of the noticeable cat population that surrounds the university’s neighborhood in North Philadelphia as a Temple student. Now, as a university employee, the 23-year-old Upper Darby native is doing something to alter the cycle-and prevent the cats from entering a very crowded city shelter system. Temple Cats, thanks to her work with coworker Terri Martin, launched in January (temple-cats.org) and boasts a growing Twitter following (templecats). “Our goal with Temple Cats is to help the stray and abandoned cat population around the university’s neighborhood. Spaying and returning the unadoptable cats is part of the process but many of these cats can be adopted and fostered. Fostering is a very big need we have. But, ultimately, the outreach and education will be the most important part because many of these cats we are rescuing were family pets who were let go. And, they are not neutered so that is feeding into the cycle,” explained Burke. 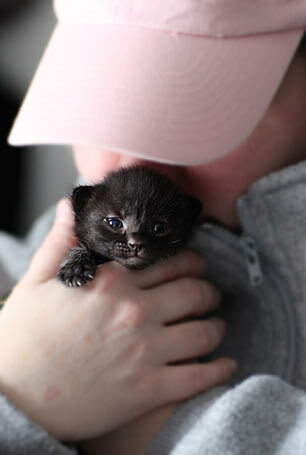 On February 4th, Burke’s foster Holly gave birth to six kittens. All the kittens have been adopted thanks to Alanna’s efforts-which include daily education to the Temple students and staff she comes into contact with. “We are constantly keeping an eye out to assess the situation in the neighborhood-and we have connected with so many people who want to help out-they just don’t know how. The good news is I thought (when we started Temple Cats) that we were going to be dealing with a majority of feral cats that were not adoptable. But, that has not been the case. These are wonderful cats that need care, need fostering and need homes,” explained Burke. The mission of Temple Cats is to rescue as many of the cats that roam the areas around Temple University as possible. Burke, along with her coworker Terri Martin and volunteers, aim to place all adoptable cats and find a humane solution for caring for any feral cats. This weekend Burke will be among dozens of animal advocacy groups, pet professionals, and hundreds of adoptable animals who will come together for With Love Super Adoption Day, May 22, 10 a.m. – 4 p.m. at the Piazza at Schmidts (2nd and Germantown Avenue). Hosted by Citizens for a No-Kill Philadelphia (CNKP), this fundraising and awareness event will bring together several animal welfare and rescue groups in the Philadelphia area along with live music, food, and vendors selling unique products for people and pets. With Love Super Adoption Day will be one of the largest adoption events nationwide. “This is already the largest adoption event in Philadelphia history and we are excited and honored to be working with so many other groups in making this day possible,” enthused Garrett Elwood, founder of CNKP. Participants and sponsors include the Pennsylvania Society for the Prevention of Cruelty to Animals (PSPCA), Philadelphia Animal Welfare Society (PAWS), Pinups for Pitbulls, Philadoptables, Rat Chick Rat Rescue, Blind Dog Rescue, The Monster Minders, Greater Philly Tails, Morris Animal Refuge, The Philadelphia Greyhound Connection, Opportunity Barks, Big Green Earth Store, and Radio 104.5 FM. The event will be emceed by 104.5 FM’s Wendy Rollins. Mayor Michael Nutter is also expected to make an appearance. Every year, more than 30,000 animals turn up at city shelters, and more than one third don’t make it out alive. Citizens for a No-Kill Philadelphia arose in 2008 out of a frustration with the way the city cares for its homeless animals. The group seeks to spread awareness about the problems in the system and propose common sense solutions. It aims to form a coalition of animal groups in Philadelphia modeled after the Mayor’s Alliance for New York City’s Animals. Animal advocacy groups, pet professionals, and hundreds of adoptable animals will come together for ‘With Love Super Adoption Day,’ May 22nd at the Piazza at Schmidts. Elwood, who has been appointed to the Animal Control Advisory Committee chaired by the Deputy Mayor, said the first step is educating the public that there is even a problem. “People are unaware about how bad things actually are,” Elwood says. “Some are even surprised when I tell them Philadelphia isn’t already ‘No-Kill.’ When I tell them that more than 70% of the cats and 50% of dogs entering Philadelphia’s shelter system are killed they are appalled.” CNKP hopes to mend the organizational and personal rifts in the animal welfare community. The group focuses on prevention measures such as high-volume spay/neuter. Once animal control is less burdened and more cost-efficient, it will free up more resources for humane care. With a new citizen-based No-Kill model, they aim to tap into the estimated $5 million funneled out of Philadelphia each year to national animal welfare agencies. “We are hoping to find homes for as many animals as we can on May 22nd, but it also about spreading awareness and letting people know about the importance of adopting rescue animals. We also hope to talk about our humane education program to attendees,” explained Elwood. For more information on Super Adoption Day, visit phillynokill.com.